This technical note will provide step-by-step instructions of how to use Dropbox to upload to or download out of Lexbe eDiscovery Suite Platform your files. Files placed in this folder also are accessible through a website and mobile phone applications. It is a file hosting service that allows you to create a special folder on each of you computers, cell phones and tablets, which Dropbox then synchronizes so that it appears to be the same folder (with the same contents) regardless of which device is used to view it (online and offline). The Dropbox application runs on Windows and Mac OS X. 1. Run the Dropbox installer. Click on the .exe file that just downloaded in the lower left corner of your browser window. 2. Click 'Yes'. Click ‘Yes’ to accept the User Account Control settings dialog. 3. Follow setup instructions. Follow the instructions to get Dropbox set up on your computer and you will be good to go! >Download benefit: It will take files with you when no internet access! You can access store documents into iPhone, ipads, androids, etc. Any file you save to your Dropbox will automatically save to all your computers and devices. >Import benefit: You will be able to bring files into Lexbe eDiscovery Platform easily from your Dropbox account. 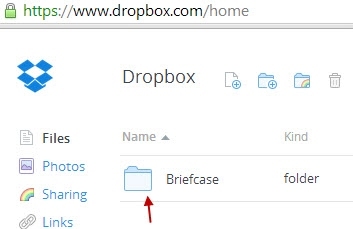 You can either export to Dropbox existing or new briefcases from the Case>Download Briefcase page. Each briefcase in the main table view documents has a check mark to the left of the document. >Briefcases can be selected one at a time this way. NOTE: These check marks persist for the page only and are lost if you navigate to another page. 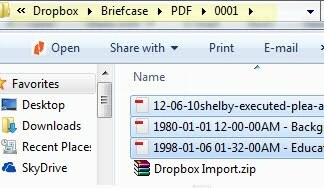 >Once you selected Briefcases to be exported to your Dropbox account, please click on the 'Export to Dropbox' button. This action automatically redirects you to a new tab in the browser, ask you sign in to your Dropbox account and also the main table will display a message indicating you that the files are being uploaded directly to your Dropbox files. 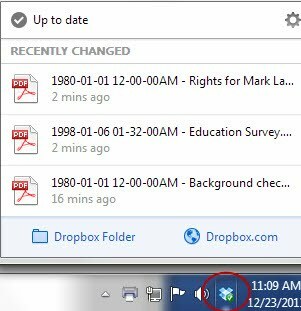 You can check the sync progress of your Dropbox by clicking on the Dropbox icon in your system tray or menu bar. You'll also know when the files and folders in your Dropbox are finished uploading when the rotating blue sync marker turns into a green check mark. From now on you should always view and work on files from your Dropbox. You can easily access the files you’ve put in Dropbox by clicking on the Dropbox icon on your desktop or the Dropbox icon in the system tray (next to the clock). >From the Dropbox folder, we recommend that you compress all files first and create only one zip file before uploading them to Lexbe eDiscovery Platform. >Login to your Lexbe eDiscovery Platform account and select the case you want to upload files. >From the Add>Add Case Document page you click on the 'Next' button, you will be taken to a new window 'Upload Dialog Box'. >Complete upload settings, close the window and click on the 'Add Files' button at the bottom and select the files to add from your local Dropbox folder. >When ready, click 'Upload'. Progress is shown for each individual batch and for the entire upload. Do not close the upload window before the upload completes or the upload will be disrupted. When the upload is complete, the 'Cancel' button will change to 'Done', you will see an 'Upload Complete' message and you can close the upload window. You will then see the newly uploaded batch in the 'Add Case Documents' Window. From here you can open the batch by clicking on its link, edit settings for an individual document using a document's edit button on the right, or edit multiple documents at a time using the 'Multiple Doc Edit' link on the left of the screen. 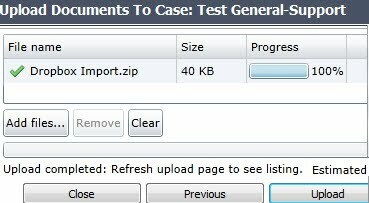 When done, the recently uploaded documents can be cleared from this screen (the documents are not deleted).